Whispers in the Garden is an at-home spiritual retreat in which you are invited into the quiet and serenity of my garden for a time of study and prayer. Each lesson focuses on a New Testament woman's sacred story and includes a biblical text, historical and scriptural context, guided meditations, and power-filled affirmations. There are questions for reflection and journal writing. Mothers, daughters, sisters, widows, and wives, they all long to share their stories of forgiveness, healing, and restoration. Their insights into the nature of the Divine will lead you into the garden of your own heart where you can linger and learn, and perhaps, even hear Him whisper your name. Would make a great Christmas gift for a special friend or loved one. If you would like to have a signed copy for pick-up, delivery, or mailed to you, please leave a message at livingjoyful@aol.com and I would be happy to get in touch with you. Also available at Amazon. com or Barnes & Noble (special order) . 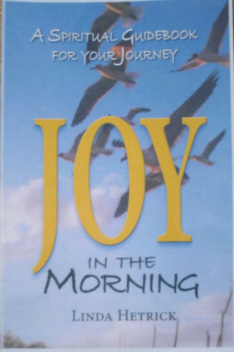 Joy in the Morning/ A Spiritual Guidebook for your Journey is a unique mixture of personal narrative, scripture-inspired letters of encouragement, and reflection guides to help you connect to the presence of God within and around us all. It offers no surefire rules or formulas to lead you to your destination; however, the journal will prompt you to record your insights and challenge you to serious reflection to discover your own unique pathway to spiritual growth. Also available at Amazon. com or Barnes & Noble (special order) for $14.95.